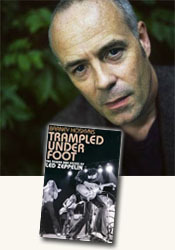 Barney Hoskyns, the author of Trampled Under Foot: The Power and Excess of Led Zeppelin , spent two years researching, interviewing and writing this book. He was relentless in his pursuit of tracking down everybody who might have played a significant role in the history of Led Zeppelin. It was an exhausting though exhilarating hunt culminating in a narrative that runs over 500 pages. We caught him in a brief moment between books—and there aren’t many—where he talks about writing and working on this, his 19th book. Interviewer Steven Rosen: There have been so many books written on Led Zeppelin—what made you think you could approach the subject with a new focus? Barney Hoskyns: I figured that talking to a lot more Zep insiders than had ever spoken before would offer a new perspective on what the band meant. I wanted to try and demystify the story a bit—write the anti-Hammer Of The Gods, if you like. Did you realize what a daunting task you had before you? I didn't realize I'd end up doing 130 interviews (and reading many others into the bargain). Where/how do you actually begin a book like this? The book really began for me after the first proper interview, which was with Richard Cole's ex-wife, Marilyn. I saw there was a great narrative there about human beings on the inside of a pop phenomenon, struggling in their different ways with the nature of rock deification. What were the hardest parts to construct? For obvious reasons I had to do more legwork and research on the pre-Zeppelin years: the London session scene and the Birmingham and Black Country circuits that Plant and Bonham came out of. Would you sort of rearrange the quotes from the various interviewees like a puzzle until they worked properly as a narrative? I tried to focus on key stages and events and elicit as many quotes on those as possible, so that I could get a real flow going. What of course makes it interesting is that everybody sees things in slightly different ways. Nevertheless there was a lot of consensus on central themes like the personalities of the group members and Peter Grant et al. How long did you spend actually gathering interviews? Researching? The research and interviews took about a year, including trips to New York and LA. Then it was another year of writing, editing and tweaking. Did you transcribe the interviews, pull out the parts that worked and then insert them into the book? Or what was the process? I transcribed some and outsourced some of the transcription to others. Then it became a massive editing job—almost like a documentary film. Do you wish that Jimmy Page had made himself more accessible to you? I'm not sure how much one gets out of Jimmy at the best of times, so that wasn't my biggest regret. I'd love to have spent a few days talking Zep with Robert, and to a lesser extent with Jonesy. And of course one wishes Bonzo and Peter were still around to interview. How were you able to get everybody to speak so openly/honestly about Zep? I think the timing was right. People have kept schtum for a long time—to no obvious benefit to themselves—and now they wanted to have their say before it was too late. There's also a momentum that builds once you've got a few key interviewees under your belt. Word gets around that you're coming from the right place and can be trusted---to the extent that a biographer can ever be trusted, which is open to much debate! What were your feelings about Zep after writing Trampled Under Foot ? I love their music as much as ever, and I think the whole story is absorbing and fascinating. Plant emerges as a hero of sorts, but even Peter Grant was a real mixture of light and darkness. Contributor Steven Rosen interviewed author Barney Hoskyns in conjunction with his review of Trampled Under Foot: The Power and Excess of Led Zeppelin (see accompanying review) for curledup.com. Steven Rosen/2012.